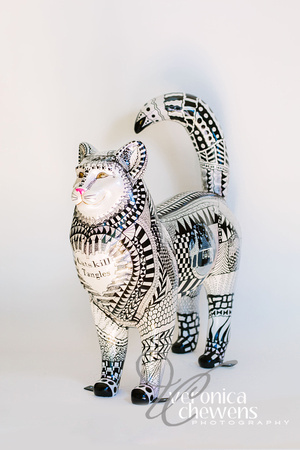 Description: This cat has white paint and small hints of pearled paint as a base and black zentangles on top of it. It also has two paintings of landscapes around the Catskills. About the Artist: My name is Amelia Gallina and I am 18 years old. When I was younger I used to come to Catskill to take pictures with all the cats for the Fourth of July. I am currently in my third year as an artist for Cat’n Around Catskill and I have designed a total of four cats. This will sadly be my last year for a few years since I will be attending college at Appalachian State University this coming fall. I hope to minor in studio art in college and continue to make a Catskill Cat after college. I hope that every aspiring artist can find a program to become a part of, like I have in Cat’n Around Catskill.